It actually began a week ago Wednesday, when I got a phone call from my mission president. 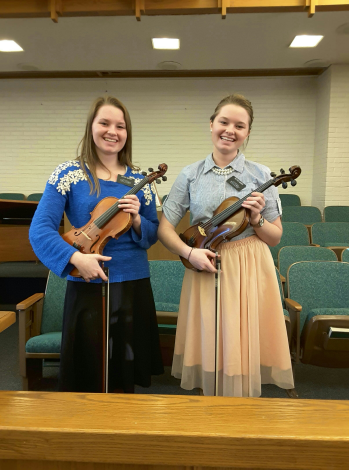 President Huntsman asked me if I could play my violin… with my sister… for our meeting with Elder Gong, Elder Ballard, and Elder Rasband. Of course I was freaking out because I was so excited to finally get to play with my sister, and then because- hold the phone- I had to play for Apostles of the Lord?? You could say this last week and a half has been pretty stressful. So lots of details go into how everything finally got together, but they are probably boring so I will skip that part. But finally the morning came. It was supposed to be freezing rain that morning which would have probably cancelled the meeting, but God answered our pleas and prayers and the snow failed to crystalize. BLESSINGS. Guys, He cares about what matters to you. To play again with my sister really was a dream come true. And all week I prayed for an ability to match my task, and that prayer was answered too- because I didn’t even feel nervous. Everything went smoothly and I was just overcome with happiness and the spirit and the music of everything… not to mention there were 2 Apostles in the room, like 5 feet away. To watch their practice session, click here.